Remember the early 90's? They were mostly kind of gross, with music predominately made by people who were about to kill themselves, but the games in the early 90's were actually pretty awesome. There was an incongruous mix of excellent plastic and oddly cheap cardboard, rules that were simple enough for a twelve-year-old to follow, and pictures of junior-high kids celebrating their Bat Mitvahs on the back of the box (they may have been celebrating something else, but I never saw an actual human being get that excited about a board game, so I don't think it was whatever they were playing). Also, I'm pretty sure they got the smallest kids they could find, because when I opened those boxes, the parts always looked smaller to me. Richard Borg remembers the 90's, too, and all those games, probably because he made a bunch of them. And if his latest creation is any indication, he misses those crazy days as much as I do, because Abaddon could have been thrown into a time machine and brought here directly from 1994. For starters, you've got giant robots. They're not called giant robots, they're called links, but they're not fooling anyone. When you have a walking machine with guns for arms, it's a giant robot. And when they fire missiles at other giant robots, you've got the start of a recipe for pure awesomeness. And when these giant robots are cool plastic sculpts (not cardboard, thank you very much Steve 'we got a million dollars to sell cardboard standups' Jackson), the recipe is getting better. Abaddon also features components directly out of the 90's, like cheap cardboard and cheesy graphic design and blank dice where you have to put stickers all over them. My favorite ridiculously dorky game component is the victory point cup, with sounds like it should be pretty cool, but is in actuality a clear plastic cup that looks like it might once have been used for urine samples. Or, given the Chinese character stamped on the bottom, it may have held pudding that was only available overseas. The rules are likewise yanked right out of the 90's. They're incredibly easy and straightforward, and go light on tactical brilliance in favor of buckets of luck. They're not complicated enough to provide for the kind of advanced maneuvering that would make Abaddon a serious game, but they still get you in the mood for firing long-range missiles at other stomping war machines. You totally get to blow stuff up. 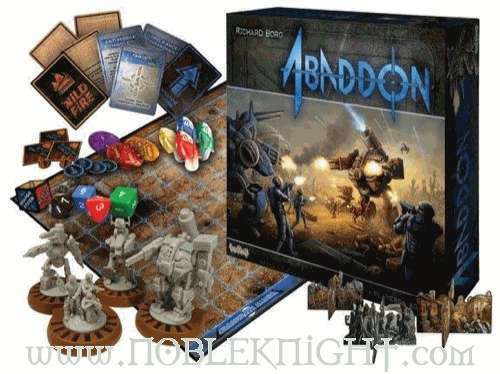 A hallmark of 90's games was that a few bad dice rolls could completely ruin you, and Richard Borg has incorporated that brilliantly into Abaddon. When you shoot at an enemy mech, there is a very good chance that you could actually get shot yourself. More than once, as we were playing, attacking mechs would be destroyed on their own turn. But there's a little bonus worked in - if you roll exceptionally bad (as in, you get a 1), your opponent suffers a critical hit, and then you draw a card and see what happens. You could wind up with a weapon malfunction that won't let you attack, or you might burst into flames, or you could get (and this is a quote) super-duper charged and actually get better. It's a wild luck-fest, and it's hilarious. One thing about lots of Richard Borg games that I've never completely embraced is the way you never know which of your soldiers will get to move on your turn. In the Command and Colors games, you use cards to determine who gets to move. In Abaddon, you have dice that you roll at the start of every turn, which means that sometimes you'll get to move everyone, and sometimes you get no turn at all. When your last scrappy mecha is holding a smart bomb to launch at an enemy, and you roll every kind of robot that is already dead, you'll wonder why you bother making any kind of plan at all. But it's not as bad as it sounds. The odds of rolling absolutely nothing you can use are exceptionally low (though it could still happen), and you can still use an overall strategy, even if the dice won't cooperate. You might hold back to build your strength, throwing long-range attacks every now and then, or you might get ballsy and just rush in, guns blazing. The beginner scenarios don't have much in the way of tactical complication, but as you play through the different board set-ups provided in the rules, you'll see more and more ways to set up crossfires, flanking maneuvers, defensive formations and other stuff that will let you send giant pneumatic robots to their scrap heap in the sky. Abaddon channels 1992 like it was brought here on the Tardis. It doesn't try to get all fancy with cutting-edge game mechanics, efficiency exercises or complicated initiative rules. It gives you cool plastic mechs and fistfuls of dice, then gets out of the way so you can blow each other to tiny mechanical bits. If you're looking for amazing production value, brilliant innovation or strategic depth, you're in the wrong decade. Abaddon is unpretentious, and reminds us why we like gaming in the first place - it's like playing with toys, only with rules. Maybe that's why I miss the 90's. I like not having to pretend that playing with plastic robots makes me smarter than other people. That, or I miss having a full head of hair. Want to play games like it was 1999? Well then run over to Noble Knight and get you some!